During his ministry, Jesus chose to live in Capernaum, a small town near the Sea of Galilee. 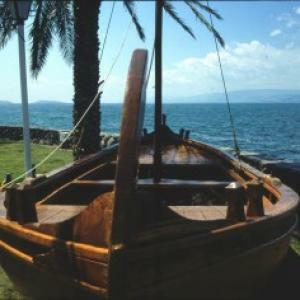 During his ministry, Jesus chose to live in Capernaum, a small town near the Sea of Galilee. Capernaum served as a military post for the Romans, and it stood along the busy international trade route called the Via Maris (Way of the Sea). The prophet Isaiah predicted that the Messiah would live by "the way to the sea," (Isa. 9:1) and Jesus fulfilled this prophecy by living in Capernaum (Matt. 4:13%u201416). People from around the world could hear Jesus' message as they traveled on the Via Maris. Many people living in Capernaum were tektons, people who worked with stones. Once a volcanic lake, the Sea of Galilee left large deposits of volcanic rock, or basalt, in the surrounding area. Jesus was probably a tekton by trade, and his hometown of Capernaum was known for their production of basalt food processing implements. Capernaum also served as a convenient base for Jesus' ministry around the Sea of Galilee. The area was home to a variety of people, from religious zealots to pagans, and from devout to secular Jews. Jesus brought his life-changing message to them all. Jesus' message was simple: "Repent, for the kingdom of heaven is near" (Matt. 4:17). Through his teachings, Jesus revealed what the kingdom of heaven looked like. This kingdom did not abolish the law, but built upon it. Jesus challenged his followers to go beyond the letter of the law. In the new order, people were called to become servants, bringing God's love and grace to a hurting world. Jesus also revealed that God's kingdom was at war. Though Jesus' death would assure the final victory, he knew that his followers would need to battle evil until his return. But he also knew that, even in the midst of evil, God's kingdom would grow. Jesus once told his disciples that the kingdom of God was like yeast working its way into the bread. As it penetrated the hearts of Jesus' followers, it would spread throughout the whole world. But many of Jesus' listeners doubted his message. They expected an earthly kingdom. And they couldn?t believe that one rabbi would be greater than the powerful kingdom of Rome. Other people believed, and became the first members of a kingdom that now spans the globe. Like other rabbis of his day, Jesus had disciples called talmidim. The disciples' deepest desire was to follow their rabbi so closely that they would start to think and act like him. Like other rabbis of his day, Jesus had disciples called talmidim, devout followers who were probably in their mid-teens. Gifted students approached a rabbi and asked, "May I follow you?" in effect, saying, "Do I have what it takes to be like you?" The rabbi either accepted the student as a talmid or sent him away to pursue a trade. Jesus broke this pattern when he chose his own talmidim. As he asked his disciples to follow him, they knew without a doubt that their rabbi believed in them. A talmid followed the rabbi everywhere, often without knowing or asking where he was going. He rarely left his rabbi's side for fear that he would miss a teachable moment. And he watched the rabbi's every move, noting how he acted and thought about a variety of situations. Talmidim trusted their rabbi completely. They worked passionately to incorporate the rabbi's actions and words into their lives. The disciples' deepest desire was to follow their rabbi so closely that they would start to think and act like him. Jesus' twelve disciples ultimately succeeded in becoming like their rabbi: Their missionary efforts changed the world, and most of them gave their lives in the process. On one stormy night, Jesus walked on the water. And Peter, wanting to be like his Rabbi, followed him! On one stormy evening, Jesus and his disciples were on the Sea of Galilee. No doubt the disciples were terrified: People of Jesus' day feared the sea and believed it was a symbol of the abyss. Most people, including fishermen, didn't even know how to swim. But on that stormy night, Jesus walked onto the water%u2014and Peter followed him! He so strongly desired to be like his rabbi that he risked drowning and stepped onto the waves. As he noticed the storm, though, Peter began to doubt himself. While he trusted the rabbi, he forgot how much the rabbi trusted him, and he began to sink. Peter reached another point of doubt during the night when Jesus was arrested and imprisoned by Roman guards. During the pain and confusion of that night, Peter denied that he had ever known Jesus. For any other rabbi, Peter's denial would have ended his position as a talmid. But Jesus was a special rabbi. After his resurrection, Jesus reinstated Peter, telling him to "feed my sheep." He encouraged Peter to take the role of shepherd, a role that Jesus had filled himself. And by choosing those words, he gave Peter a wonderful promise: "Even though you've stumbled, you can still be like me." As Christians look at Jesus' talmidim, we are challenged to radical discipleship%u2014following the Rabbi regardless of the cost. Today, most of Jesus' followers lack the passion of the talmidim. 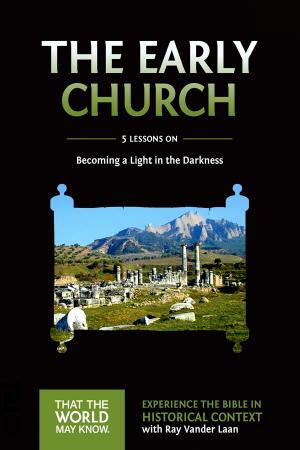 We think of discipleship as learning theological knowledge rather than devoting our lives to the Rabbi. All too often, God's people miss opportunities to experience God's power and walk on water. We are just too busy with our own schedules and goals. Or we are too afraid to leave our security behind. But as we look at Jesus' talmidim, we are challenged to radical discipleship%u2014 following the Rabbi wherever he leads, no matter how scared we may feel, and no matter what he asks us to leave behind. Jesus truly believes his disciples can become like him, even when we feel tired, fallen, or incapable. The first twelve disciples were ordinary people, but with God's power, they transformed the world. Our world still needs transformation. It is filled with superficiality and selfishness, and people yearn for something real. They aren't impressed by hypocrites, but rather take notice when someone puts everything on the line for their God. If Christians are willing to demonstrate radical discipleship, the people around us may just want to meet our Rabbi for themselves. How about you: Where is God asking you to walk on water? Will you follow your Rabbi as he steps out of the boat?